Does this name ring any bells for you? For myself, EVERSOFT is a familiar name, I’ve seen and used these products and they have been around for a long long time (since 1985)! It has been around for many years, and you can’t miss its presence because it’s sold everywhere at all leading supermarkets, hypermarkets and selected personal care stores nationwide and is one of the household names that feels very close to my heart! 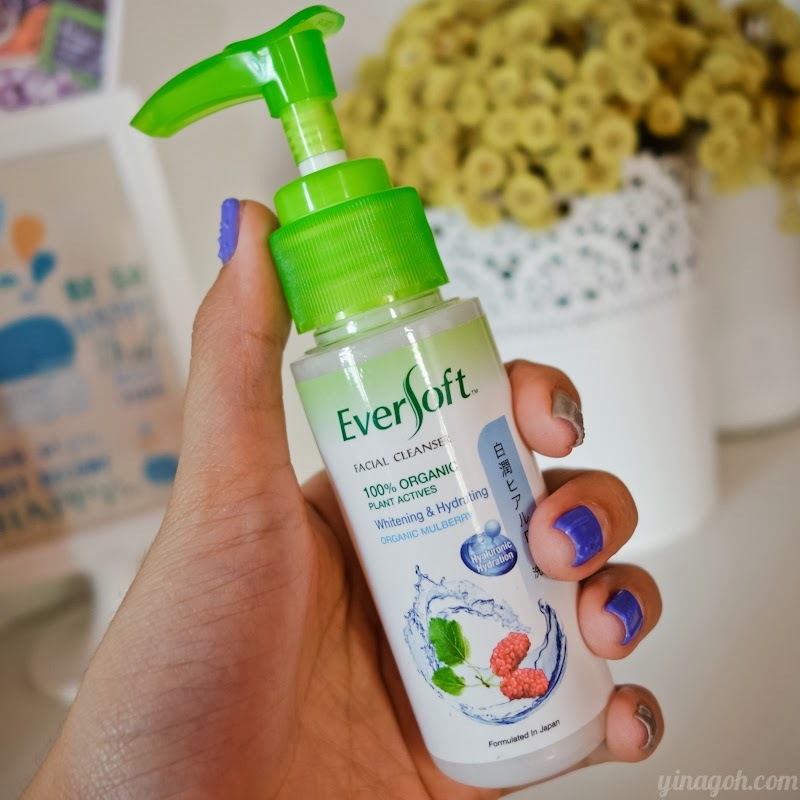 I have fond memories of EVERSOFT, because I remember it being one of the first few cleansers I used when I started a skincare regime in my younger years! My mother probably bought it and had it in the house, and I remember that familiar green logo, though the packaging was very different years ago. Just seeing the logo gives me a warm and fuzzy feeling, somehow 🙂 So I was very interested and excited to know that I’d be tasked to write a review for EVERSOFT’s latest product! Introducing the new EVERSOFT Organic Mulberry Liquid Facial Cleanser, which is a 2-in-1 cleansing liquid that combines the benefits of whitening and hydration! Cleansing is very important especially in our current lifestyle, we encounter so much pollutants, dirt and stress everyday that it is inevitable that our skin becomes dry, dull and tired looking! Thus, it is essential to maintain optimal hydration for supple, radiant and silky smooth skin. And hydration begins right from the very first step of your skincare: Cleansing! My main issue with skincare is that my skin is quite sensitive and also a little on the dry side ever since my bout with acne and Roaccutane, thus, I am quite particular about cleansers. I can’t use cleansers with harsh ingredients that strip the skin of its natural oil and moisture, and I also hate that dry, tight feeling you get after using particular cleansers, it makes me feel like my face is about to crack! Well, the new EVERSOFT Organic Mulberry Liquid Facial Cleanser is formulated with Japanese Technology, and its gentle and soap-free formula is infused with 100% Organic Mulberry extract to effectively revitalise dull, tired-looking skin while boosting its natural radiance. Organic Mulberry is chock full of anti-oxidants that is naturally rich in Vitamin C and Amino Acid! It is also enriched with Hyaluronic Acid that preserves long-lasting hydration to continuously moisturise and soften skin, and these two ingredients together will help to give you healthy and luminous fair skin! 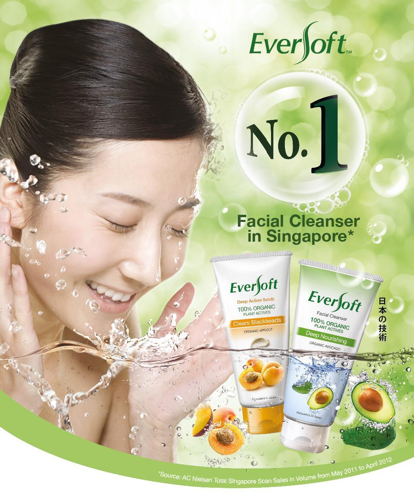 I’ve tested and tried the EVERSOFT Organic Mulberry Liquid Facial Cleanser for a week or so, and I can understand why EVERSOFT is the No.1 facial cleanser brand in Singapore. For only $9.90 for a 150ml bottle, this is an amazing product! I love pump-format liquid cleansers because they are so convenient: one pump dispenses the product easily without any fuss at all! The texture of EVERSOFT Organic Mulberry Liquid Facial Cleanser, it’s quite liquid-y and runny, but easily lathers into a rich and gentle foam. I love the scent of EVERSOFT Organic Mulberry Facial Cleanser, it has this fresh-smelling sort of pleasant soap fragrance! Even its smell has a homely feel to me, for some reason, hahaha. After cleansing, rinse off thoroughly with water, and you’d find that your skin feels soft and supple, without that uncomfortable feeling of tightness or dryness! I was really impressed by how comfortable my skin felt immediately after cleansing! PS. It is suitable for all skin types because the formulation is made from certified organic extracts and is gentle yet effective! Right after cleansing, I usually follow up with a non-alcohol toner (I find that toners that contain alcohol are very harsh on the skin so I avoid them) and an oil-free serum and moisturiser! When your skin is well-cleansed and prepped, it will help to absorb your other skincare products even better, to give you an even better complexion! 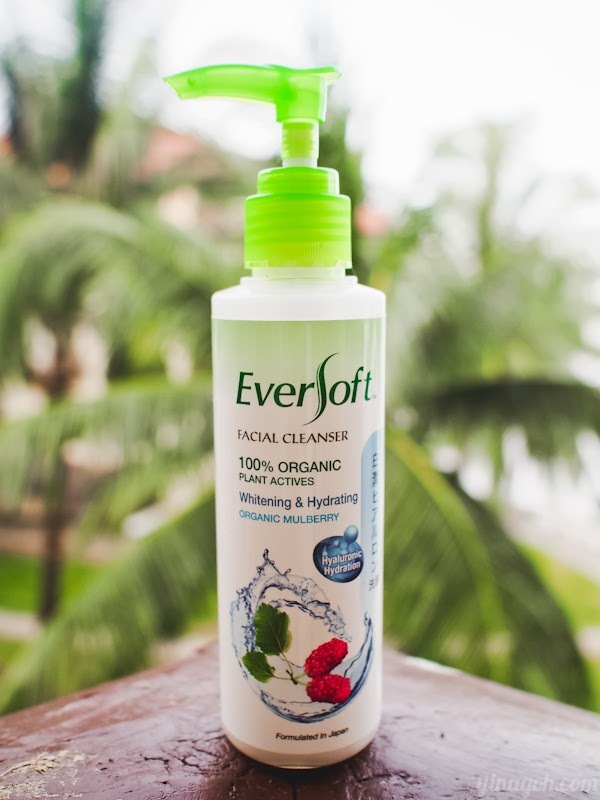 Thankful that my skin has been behaving very well ever since that major breakout, *touch wood* trying out new products is always a gamble, but I’m happy to say that EVERSOFT Organic Mulberry Liquid Facial Cleanser is a winner for me! If you’re looking for an economical yet effective cleanser, you should give EVERSOFT Organic Mulberry Liquid Facial Cleanser a try! After all, it certainly isn’t going to break the bank! Especially for you readers, I also have a give-away! !